After the long and cold Canadian winter, the spring finally arrives. A period eagerly awaited by the local who have been dreaming of walks in the sun and fishing trips! A sport, a tradition and even a way of life for our cousins of the “Belle Province” who have remained very close to nature and their hunting roots. From the month of March, they flock to ‘Outfitters’, old-school fishing clubs and private hunts for wealthy Americans.. Since the late 70s, these traditional guesthouses have been welcoming all those who wish to holiday by the side of a lake! Whether they be fishing enthusiast or simply travelers curious to experience a stay in one of these traditional accomodations. In Québec, there are more than 600 outfitters, all located on the edge of lakes rich in fish, usually salmon trout. Here are three of the oldest and finest outfitters in the Mauricie and Lanaudière regions, between Montreal and Québec. Number of lakes: between 500 000 and 1 million: nobody can agree on a number! It floats like an air of sulfur on the Kan-à-Mouche outfitting of Saint-Michel-des-Saints in Lanaudière. Legend has it that this was a private fishing club run by an iron lady named Carmel Daury, as well as a venue for discrete meetings between the “little women” of Montreal and drunken businessmen…Open since 1946, this beautiful lodge is located on the edge of a 27 hectare lake and has been frequented by many Canadians and Americans who have come to seek the tranquility of an area secluded from the world. The most famous guests of “Madame Carmel” are without a doubt John F. Kennedy and Marilyn Monroe who loved to stay in the little log cabin furthest away from the main buildings. The couple came here by seaplane, the only way to access Kan-à-Mouche in the 60s. Now it is easily accessible by road from Montreal in two hours. But guests can still stay in JFK and Marilyn’s favorite cabin, which has hardly changed much (ask for the Chalet de Portage). At the time, the lovers were content with just love and the clear lake waters to keep them entertained, before warming themselves at the end of the day next to the wood fire which is still in service today. These days, the 11 Kan-à-Mouche chalets are more comfortable and fully equipped for a real cozy weekend by the water’s edge. Kan-à-Mouche also has a very good restaurant for those who return empty-handed from their day of fishing ! 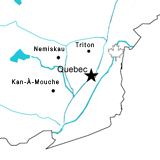 The Triton Fish & Game Club, located in the Mauricie region, was founded in 1893. At that time, rich industrialists and businessmen from the United States went on a buying spree of land in Québec to set up private clubs for fishing and hunting. Triton was the most famous, attracting visitors such as Roosevelt and Rockefeller. Like them at the time, it is still necessary to follow a long forest road, then embark on a small flat-bottomed boat to arrive at the lodge nestled deep in a river overlooking a lake. The arrival on the water is always breathtaking and little or nothing has changed in these unspoiled landscapes for over a hundred years! The outfitting itself has retained its authentic décor thanks to the painstaking restoration work of the current owners. La Seigneurie du Triton was abandoned for years before it was revived, to the sheer delight of all those who seek to isolate themselves from the modern world for a few nights. The main building, which houses a restaurant and bar, is decorated with old furniture, hunting trophies and skins. Fred, an authentic trapper will also happily explain the art of trapping to you that he has practiced since his childhood. He will steer you in a canoe on one of the 12 lakes in the outfitting and take you to warm up in an Indian teepee, just like he did when he was growing up with the descendants of the original inhabitants of Canada. In this building, the rooms are basic, but in two other beautiful buildings nearby, guests can enjoy all manner of modern comforts: fireplace, private bathroom, etc. And as this outfitter is located far from civilization and is only accessible only by boat, he will not give you a key. Here all guests live like friends and share their stories in the evening by the fire, just like the good old days of the trappers! In the language of the first inhabitants of Québec, Némiskau means “where fish are abundant”. 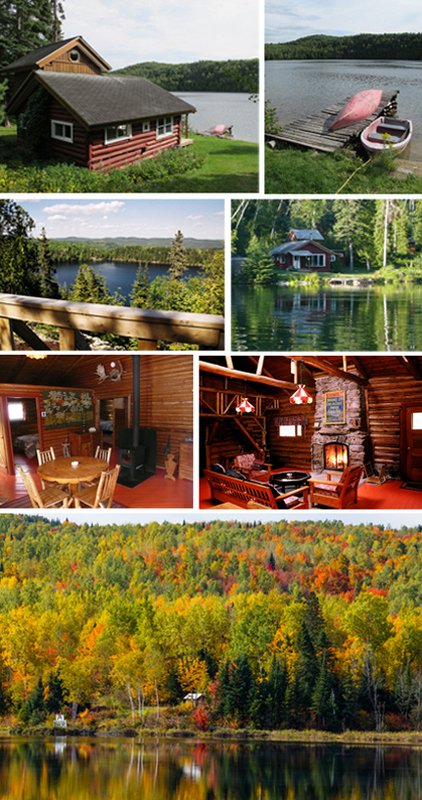 It is no wonder, then, that a lodge has been created here in the middle of a vast forest area in Mauricie. The Némiskau outfitting is one of the newer ones in Québec and probably one of the most luxurious too. This is evident in the several Jacuzzis, both outdoor and indoor, which allow visitors to bask in warm water whilst admiring views of the lakes! Historically, outfitters are simply rustic shelters for fishermen and hunters. The fact that it has a spa is exceptional and clearly demonstrates the comfortable character of Némiskau. This outfitter is also famous for its tasty and inventive cuisine. In short, a stay here is above all a relaxing time for connoisseurs. There are many pleasant foot paths that lead through the vast territory of Némiskau. And one can also, as in all outfitters, rent a small boat to explore one of the area’s 11 lakes. As the man running the place, Stephane Tremblay will happily give you a demonstration of the traps that he uses to trap bears, beavers and foxes. Because at Némiskau, it is not fish that abounds…this area is very rich in wildlife. Which is not surprising, considering you’re in the middle of nowhere, and the first village is over an hour away. Peace and quiet totally guaranteed!